What is the Self-Generation Effect? Self generated statements are remembered more easily than statements learned from other sources. 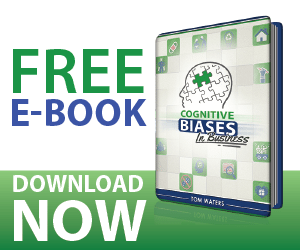 This cognitive bias is the foundation for probing questions in the modern sales cycle. By asking questions about the buyer’s experiences and walking them through their own revelations about how your company can add value is much more effective for larger sales than rattling off the great new features of your product or service. Creating a self-generated value proposition requires your prospect to invest time and consideration into a conversation with you. By determining the needs you must fulfill in order to effectively provide value, you can ask questions that lead the prospect to connect your solutions to resolve their issues.